(CNN) - Sunday has long been a day for reflection in Joplin, Missouri, with residents flocking to churches and other places of worship for guidance, understanding and a sense of community. 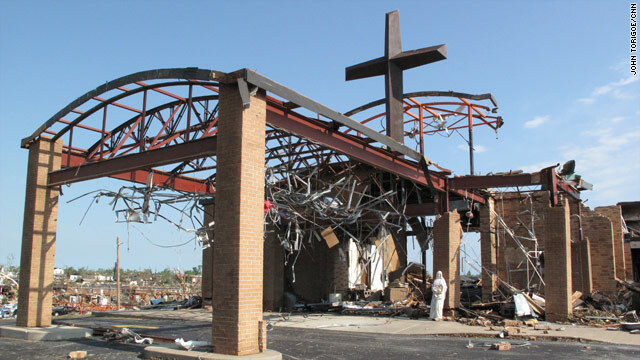 Now, several of those churches are gone, as are scores who might otherwise be going to them, thanks to a horrific tornado that ripped through the southwest Missouri city one week ago. That makes this Sunday especially significant, not to mention the subsequent days, as religious leaders try to offer meaning after such a senseless disaster. "You could see ... the challenge they are going to face, as they preach funerals in the weeks to come," Missouri Gov. Jay Nixon said after meeting faith-based leaders this week. "It's enormous." Nixon, along with President Barack Obama, will be among those attending a special memorial service at Missouri Southern State University for the 142 killed (as of Saturday evening) and thousands more affected by the tornado. Then at 5:41 p.m. - exactly one week after an EF-5 tornado, with winds over 200 mph, first touched down - the city will go silent. That moment will be a stark contrast to the fury the Rev. Justin Monaghan experienced as the twister barreled toward St. Mary's Catholic Church. The 70-year-old pastor got in a bathtub at the church, put his face down and prayed. When the winds ceased, Monaghan found himself trapped in the rubble - where he remained until some of his parishioners rescued him, unscathed. While he's still coming to grips with what happened, Monaghan said he believes that good will come out of this tragedy and in fact already has. That positive energy was on display Saturday on the church grounds. There, parishioners and volunteers picked through the debris looking for items to salvage, Monaghan said. One found the pastor's Bible, and another was able to save his golf clubs. "The enthusiasm was unbelievable, even as people were shedding tears," Monaghan said. "It's just wonderful to see." On Sunday, Monaghan said he will celebrate Mass at St. Peter's, another Catholic church in Joplin. And if and when his church is rebuilt - something that he expects will happen, with the parish council's support - the pastor said a 6-foot cross that somehow braved the storm will be a part of it, behind the altar. "We wouldn't dream of not using that," he said. The Bridge Ministries, a nondenominational Christian youth organization, has opened its doors to schools, relief agencies and churches in need of space. They include members of St. Paul's United Methodist Church, which will hold their Sunday services at the ministries' center after their own facility was severely damaged in the storm. Dan Mitchell, the organization's president, said he has been impressed that so many people, from near and far, offered help. Food, water and clothing have come in everything from car trunks to tractor-trailers, he said, and the center's parking lot has transformed into a distribution point for supplies. Meanwhile, Mitchell said that locals directly affected have seen their faith strengthened in the past week. "Faithful Christians who understand that God creates order from chaos have stood up and done what it takes," he said. "They have given up their lives. If they come up against roadblocks, they get around them and they get it done." CNN's Jacqui Jeras and Mike Pearson contributed to this report. May you ask your president not to support the tribe men and the opposition parties against the legitimate country ruler....allow him to do changes while on post until his period officially ends while marking a new presidency votes and elections....we do not want to start our new country system change with a coup against the our rulers at such shaken times world wide...obvious you are supporting the tribes since they are allies of the KSA who obviously is trying to turn the whole area of the Arabian Peninsular into becoming Royalists burying therefore the orphan Republic alive..by demanding the president to leave his ruling seat to so many ghosts who will fight over it to no end?? Assist him to secure law and order for the benefit of the majority who are staying back at their homes...those you see in demonstrations are people who came from extreme country boarders and mountains who are paid and financed to do all the mess in the cities of the real inhabitants....our cities people are being killed and robed by such those...America you are being used to pave roads for others to dominate on account of others unrest....America are you a republic or a royalist? Or are you still ruled by the British Crown? Government officials in Yemen say President Ali Abdullah Saleh survived the assault by tribal foes, but an opposition TV station says he was killed in the attack. As battles erupt around the capital, there is speculation he has been wounded. May God he be saved and be victorious against his rivals...Amen. [48:3] Additionally, GOD will support you with an unwavering support. [48:4] He is the One who places contentment into the hearts of believers to augment more faith, in addition to their faith. To GOD belongs all forces of the heavens and the earth. GOD is Omniscient, Most Wise. [48:5] He will certainly admit the believing men and women into gardens with flowing streams, wherein they abide forever. He will remit their sins. This is, in the sight of GOD, a great triumph. [48:6] And He will requite the hypocrite men and women and the idol worshipping men and women, for they have harbored evil thoughts about GOD. Their evil will backfire against them. For GOD is angry with them, condemns them, and has prepared for them Gehenna. What a miserable destiny! [48:7] To GOD belongs all the forces in the heavens and the earth. GOD is Almighty, Most Wise. [48:8] We have sent you as a witness, a bearer of good news, and a warner. [48:9] That you people may believe in GOD and His messenger, and reverence Him, and observe Him, and glorify Him, day and night. Some Physics says:"Read Leviticus. The anti-gay rules are not part of a story or a parable or optional. They are very clearly delineated. Therefore, you can either be a good Christian and be openly anti-gay, or you can not be a Christian. There are no other options." If you truly believe that, it means that if you are a "good christian" you must be a desp.icable human being. There are no other options. LinCa- You are doing what so many do, you are attempting to define an entire group by one persons. As a African American I hear this a lot from other African Americans. They had one bad boss or some white person says something racist some where and they begin to point that racism is all that whites are about. They then follow that any white person who is not racist is either lying or is not a “true” white person. Lin, I stated a few months ago that I really do not think that those out side of Christianity truly understand it. They feel we are monolithic and we all move to the beat of the same drum. This can not be further from the truth. I would say by the multiple denominations it should show most Atheist that all Christians do not believe the same thing. The thing is that I know how folks within the same denomination, within the same conference and even within the same church often interpret scripture differently. You state that there are no other options. What about the hundreds of Gay and Lesbian churches. The mainstream churches that are open to Gay and Lesbian members? The openly Gay Bishops and pastors? It seems that within Christianity there are thousands of “options” or do you feel that one persons post, in one sweeping action, just negated all of the Gay and Lesbian Christians out there? I am well aware that not every christian is evil or desp.icable. I didn't, and don't, define every single one by what this moron said. Please reread what I wrote: "If you truly believe that, it means that if you are a "good christian" you must be a desp.icable human being." The part in bold is important. That means that if you don't believe that, there is still hope. This bigot, and I'm speaking specifically about Some Physics here, took his or her book of fairy tales, picked a verse that fit his/her prejudices and uses it to justify and spread his/her hate. Unfortunately this bigot isn't alone. There are millions just like him/her. And what's worse, the gay-bashing isn't the only problem with christianity. Also, whenever Leviticus is used to condemn gays, I wonder if whomever is doing the condemning also doesn't eat shellfish or plants 2 different crops side by side, or doesn't wear poly/cotton blend garments. Do they really kill their children for talking back to them? These are all things explicitly specified in the bible. I somehow doubt that those parts are followed to the letter. Anytime religion is used to do or say horrible, immoral things, that is a problem with that religion. I don't expect that Some Physics would be less of a bigot if he/she didn't have religion to justify his/her hate, but society would (most likely) be less inclined to condone it. He/she would then be more like the racist you refer to. I've said this before, but I'll repeat it here for clarity, anyone is free to believe whatever they want. In the US that is specifically provided for in the 1st amendment to the consti.tution. And I fully support that. What we have here is really a simple matter of jurisdiction. I reside in the US, therefor the US consti.tution is the supreme law applicable to me. The 1st amendment gives me, and everyone else, explicit freedom of religion. Because everyone has the same freedom of religion, that can only mean that anybody's freedom of religion ends where mine begins. Therefor, everyone is free to impose additional restrictions on themselves based on their religion, but these restrictions DO NOT apply to anyone else. In other words, if you believe your bible holds guidelines or laws or restrictions to live by, that is fine but they only apply to you. To me, the only value of the bible is it's caloric value. It keeps me warm when I burn it (although I will never burn it to make a statement). I wonder if Some Physics actually read all of Leviticus and follows all of it. I wonder if Some Physics has stoned any disobedient children lately. If not, he or she is not a true Christian. I hope Some Physics doesn't like bacon, either. "No, it is not required but do not forget many Christians are taught and hold to be true the common quote that you can not get to Heaven by good works alone"
Yes, I love the giant loophole that christianity creates where a murder can ask for forgiveness and go to heaven but a person who does good and kills no one but doesn't bow down to nothingness gets to go to hell. that sounds fair. "If a klan group goes and burns a cross on someones lawn does that devalue your lifes worth if you are white?" the klan likes to cherry pick from the bible just like everyone else which obviously values white christians over other races and religions. They de-value innocent bystanders. Same thing when a suicide bomber blows up innocent people because their specific belief allows them and encourages them to see people not like them as inferiors and deserve to be killed. Obviously there are different sects of all religions which is awesome in itself and shows that obviously god is an idiot for not seeing all the ways his "word" could be twists and cherry picked and be confusing. Religion allows easier justification of horrific acts against innocent people. Wars: WW1 – Imperialist expansionism with religious clashes between various christian sects as well as others religions. Pretty much unfounded devotion to the tribe to destroy the others. WW2, yeah, I guess killing Jews because they were Jews wasn't religious. Revolutionary war was decades/centuries in the making breaking from church of England rule and religious prosecution was just part of the whole but was obviously important giving the first amendment being added right away. 1812 was pretty much Rev war the sequel telling England to shove it. Civil War when it comes to the slavery front the bible was used as justification because obviously the bible is quite pro-slaves as long as you don't be them so bad that they die too quickly. Good acts: My only point is that there is no need for religion for people to do good things, if religious groups do good things then the good things deserve recognition their religion doesn't need the credit for a human doing something good because human feel good to do good things. If your religion is the only reason you do good things, then you are not a good person, you're just a fake. In regards to views on gays: yes, i know that there those who are religious and do not discriminate against gays, or any other group that they feel superior to. The problem being the Christians that support gay rights stay quite quiet and don't loudly denounce that the other sects are wrong, and the mass of them that silently support the extremist actions. Muslims have the same problem and the extremists are your mouth piece whether you agree with them or not. The only people that can stop the extremists are those they supposed to be speaking for, the silence just amounts to agreement with them. The entire problem with religion is that there are so many of them, and they all claim to be right. Even if you lump all the sects of christianity all together you get around 33% of the world population, that mean AT A MINIMUM 67% are definitely wrong. of course you'll have many christian sects that say the others aren't true christians, you'll have the same problem with islam, so the figure is more like 80-90% are definitely wrong, if in fact one is truly correct, but which one? If any of them actually had compelling evidence there wouldn't be so many. With all the technology today it would be a good time for god to stop being a passive jerk and come down and let us know what's up, the entire world would know about it in a few hours. There's no shred of evidence that any of the religions are right. There's no evidence of there being a personal god (yahweh, allah or otherwise). and there isn't any that there's a "god" at all. Please show me that there is definitely a god and that he is definitely because I would really like there to be one, i just haven't seen any compelling evidence to suggest there is. So I can't believe in any of them. In the off chance I rather have to justify why I didn't believe in any god then believe in the wrong one. Is that fair that you desert God because who carried things in his name were wrong doers committing unpleasant things in his name....? Wow Eric. By leaps and bounds you went. Ok, I have a bit of time before I head to bed to respond. In the klan statement, you failed to answer if it makes you, if you are white, feel like less than a person. I know the African American family whose yard that they are burning the cross on does not feel like less of a person(s). I still am waiting on you to better explain this de-valuing concept. If you are just tying to Ivy League the simple concept that people look down on other folks, then sorry, that will happen within the Faiths and outside of the faiths. Folks are going to think you are worthless for some reason. Might be your skin color, might be your height, could be the car you are driving tomorrow. Society has a nasty way of people standing on top of other peoples shoulders to make themselves feel better. If this is what you are trying to say then on that one... best grow up kid. The WW1 … Ok, History major... that is not true but I am open for you to attempt to define the different sects. I thought it was because Germany was being squeezed for resources. WW2 …. Sorry, …. I forgot, when did the mighty Jewish Army attack over the Rhine? To further blow holes in that wild thought.... When the Nazis first began there was a record of Jewish Nazis Youths. >> religious groups do good things then the good things deserve recognition their religion doesn't need the credit for a human doing something good because human feel good to do good things." Disagreed, as person not of Faith it is one of those things that you do not wish to accept and that is cool. You are a DeCarte fan aren't you:) Come on dude admit it. If a group from the Senior citizens home comes to the jail house and cooks Christmas dinner or Thanksgiving dinner for the inmates then is there an objection if the warden thanks them as the residents of such and such retirement home? Would you object if they all identified themselves as “Hi I am Thomas, I'm with Shady Hills home and I come here today as a resident of Shady Hills to help you” Is this bad? If it is not bad then you just fear Christians and other Faiths and thats a hurdle that is within you. If it is bad for them to do such, to be identified as part of a team.. then Eric your fear is plainly just teams and groups. I think you should stick to Golf and Tennis. The rest of society will take the good teams with the bad and just move forward. >>> “If your religion is the only reason you do good things, then you are not a good person, you're just a fake.” Already covered in the do not go to Heaven by good acts alone. Heck, our church just does what it does to help the community. We help as the members of the Church. If you feel you know better , if you claim to know whats going on in our heads, then that is just another one of your wild thoughts. Ahh.... I could go on and on about this but it is late. The thing is that many of Faith spend more time focusing on what the guy in the next pew, the next church or the church on the other side of the planet thinks. Personally, I have more important things to deal with than worrying about another person of Faith. Now if he starts to want to fly a plane into a building or walk up to a abortion doctor and blow his brains out... I would have issues. For the most part, my Faith is a between me and God. It is what allows me to go into various denominations and other Abrahamic faiths with out that much of a issue. I do not feel that it is my first job to tell them that the way that they worship or know God is “almost” right. My first job is to have God in my life and go forth through the rest of my days trying not to fall short of what I feel God expects of me. Ok, that is a curve ball, that if you are honestly making this claim, I was and am not ready for. It does pose a question that I never thought of.... are there Atheist that really wish to find evidence that God exist? I thought that all of you were looking for a anything to say there is not a God, then along comes this kid and I have to admit I am a bit thrown. I am going to leave it here, for now. Eric... part of me want to continue to beat you over the head with a a foam whiffle bat about your post but your closing comments have me a bit stopped. Muneef,. If you are speaking of posting here on the belief blog it depends on what was your goal was for coming to the Belief Blog. I have found that many come to the belief blog and naturally expect that everyone that post or read are some how weaker or not as strong in their views as they are. Time and again we see post go up and people are shocked and confused that those who post from a different view are still holding on to those views the next day after what they could only call a thrashing. If anything I feel that there can be respectful exchanges and peace and understanding can be created. The problem is that just as in society, there are rabid extremist on all sides that would rather die than to see it happen. So, you get trollish post after post from fools that just want to start a fight with the other side. So, what was your goal in posting here Muneef? –> "focus on make this life better for everyone instead"
We are investing in faith and in the love of God our Own Personal Time,Own Family time,Own career time...!! Just I pray to God all the few months were not time wasted..on as we say wasted on talking to a brick of wall or on trying to tickle a camel....!! I just love how the most religious state in the country (Louisiana) has the highest murder rate, and the least religious (NH and VT) have the lowest, they also have the lowest teen pregnancy rate too. There are a lot of people going to hell in the more religious states. Eric, that's your American problem and a twisted opinion at that. Christianity liberated the world and made it a civilized place. Countries with a long history of Christianity created ideal states for all, although post-christian nations are deteriorating. Really? Is that why the least religious countries are the happiest and have low crime rates? Believing that fairy tales are true completely skews people's views of reality. Muneef, God doesn't hear evil doers' prayers. You need to believe in Jesus. Also, grant freedom and equality to infidels and women in your country. And never force any child to get married. Or better yet, everyone come to the realization that all these religions aren't true and focus on make this life better for everyone instead of throwing this life away for the belief of another one after this one. This type of belief in an afterlife just de-values this life. Eric, the opposite of your opinion is true in reality. must. not. feed. the. trolls..... must. not. feed. the. trolls. The opposite of your opinion is true in reality, Adelina. Eric, what about the churches such as mine that do food drives, medical seminars and events, and job and marriage counseling? We are doing all of it as a calling from our Lord. Is this not trying to make life better for others? –> "throwing this life away for the belief of another one after this one." Isn't the view of what folks do with their own time really up to them. If I choose to teach in the inner city I have had many friends say that it is a waste and I am throwing my possible career away, am I? Eric, there will always be folks that believe that unless a person is on the same exact path as them they are "throwing their lives away" or wasting their time. It can be in any aspect of our lives. As it sounds you are a Atheist and feel that it is throwing our lives away. Places such as this blog are places that you can meet a person of Faith and find out that to many of us it is a very joyous thing to be a child of God and that even though you feel it is not a life we do. Saying we are throwing our lives away is no different than some part of our group running up into your face and saying that you will burn for eternity. Mark, all those things can be, and are, done for just the reason of it being a positive thing to help your fellow man. god or the threat of hell or the reward of some fantasy afterlife is not required. Mostly the problem with de-valuing this life is when you de-value my life too. You can throw your life away for all I care as long as you don't take anyone with you but seems rarely to be the case. History has just been a long on going clash of religions. So many people have been harmed and are still being harmed because of the belief in something that just isn't so. Two things that are propagated by current christian factions. AIDS is bad, but condoms are worse (catholic church). Don't worry about climate change or the environment, god promised that he wouldn't allow the destruction of the earth again after the flood (fundamentalist christians). Name one positive thing that religion can do for mankind that can't be done via secular means. Name one good non-religious reason to oppress gays. (because it's icky is not a valid reason). No, it is not required but do not forget many Christians are taught and hold to be true the common quote that you can not get to Heaven by good works alone. So I think that is why we question when Athiest believe we are doing such good works just to get to Heaven. This is some thing that is preached and taught.... I remember a sermon in which the pastor said if you are doing works around the church and for the church and think that it will get you into Heaven you need to stop now. Is that not a personal issue you have with yourself. If a klan group goes and burns a cross on someones lawn does that devalue your lifes worth if you are white? If the bloods and the crypts get into a shootout and three kids get killed, I do not feel it devalues my worth of life. I am interested in this “de-valuing of life” you speak of. If possible can you go further. World War one and World War two...were these a clash of religions. The Civil War, the Revolutionary War and the War of 1812... Can you describe the Religious sides in these. I would touch on Korea and Vietnam. -> “Name one positive thing that religion can do for mankind that can't be done via secular means.” I would hope nothing. If an Atheist group is feeding the homeless on the North side of town and the Catholics are doing the same on the West, the Muslims are at the South and the Jewish community is at the East.... I would call that a greatly blessed and helped town 🙂 Question, because such can be done by Secular means does that mean that the Religious side should be shuttered? For example, Katrina hit and there were groups that were “in there” helping the community right after the storm passed. Is it ok that the Government comes to each group and dispenses funds to both groups for their service? On this one I got a bit of a laugh because it sorta paints you, the one asking the question as a person who believes that all religious groups are monolithic and work to oppress Gays. There are Gay and Lesbian churches, I have visited one a few years back. Gay bishops and pastors. On another thread here I posted how I was checking out a African American Lesbian who had a crazy hatred of gay men. Her statement was that Lesbian marriage was ok but Gay males it was wrong.